Much of the information on the human health effects of inhalation exposure to mycotoxins comes from studies done in the workplace and some case studies or case reports. * Many symptoms and human health effects attributed to inhalation of mycotoxins have been reported including: mucous membrane irritation, skin rash, nausea, immune system suppression, acute or chronic liver damage, acute or chronic central nervous system damage, endocrine effects, and cancer. More studies are needed to get a clear picture of the health effects related to most mycotoxins. However, it is clearly prudent to avoid exposure to molds and mycotoxins. Note: Information on ingestion exposure, for both humans and animals, is more abundant -- wide range of health effects has been reported following ingestion of moldy foods including liver damage, nervous system damage, and immunological effects. If mold is a problem in your home, you should clean up the mold promptly and fix the water problem. 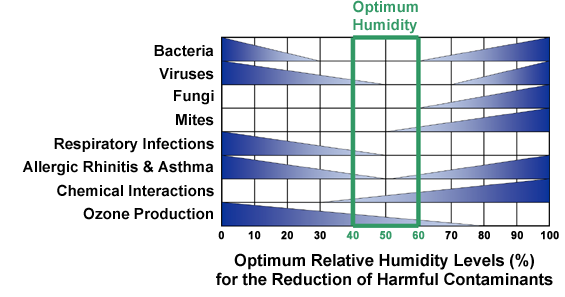 Keep indoor air near 50% RH. * N.Y. State now requires all Mold Assessors to be Licensed. During the course of our inspections will alert you to the possibility of "mold" issues and can direct you to a Licensed Professional if required. Due to changes in the law we no longer offer assesment or testing services for mold.